I will admit that I was out of my comfort zone with this project. So I told myself – YOU CAN DO THIS – and I DID! Actually, it is fun to play with Brusho as there are no rules – just enjoy the color! This was my first cards – done in red and yellow Brusho on watercolor paper. 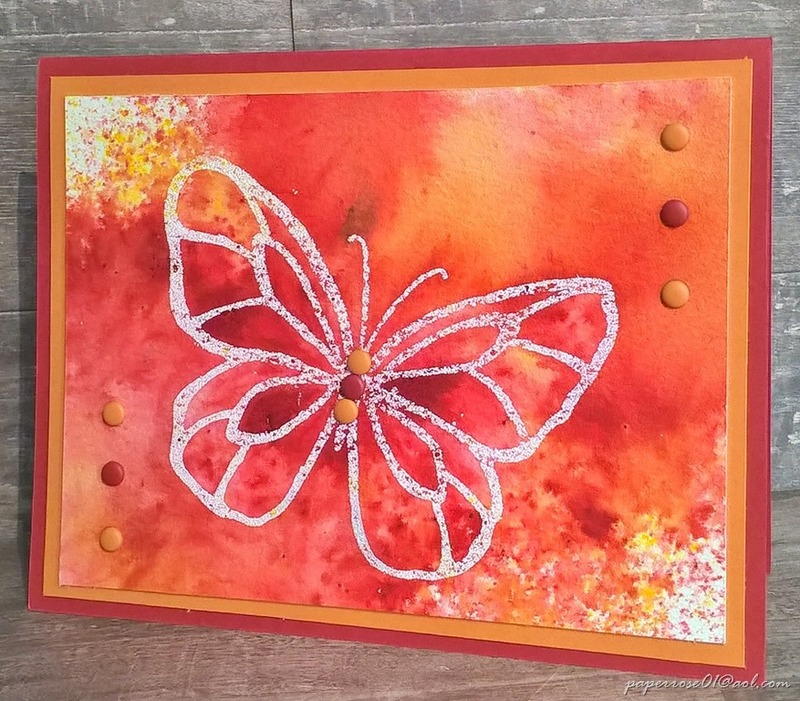 The butterfly had been wet embossed in white and because of emboss-resist, the Brusho did not adhere to the embossed butterfly. 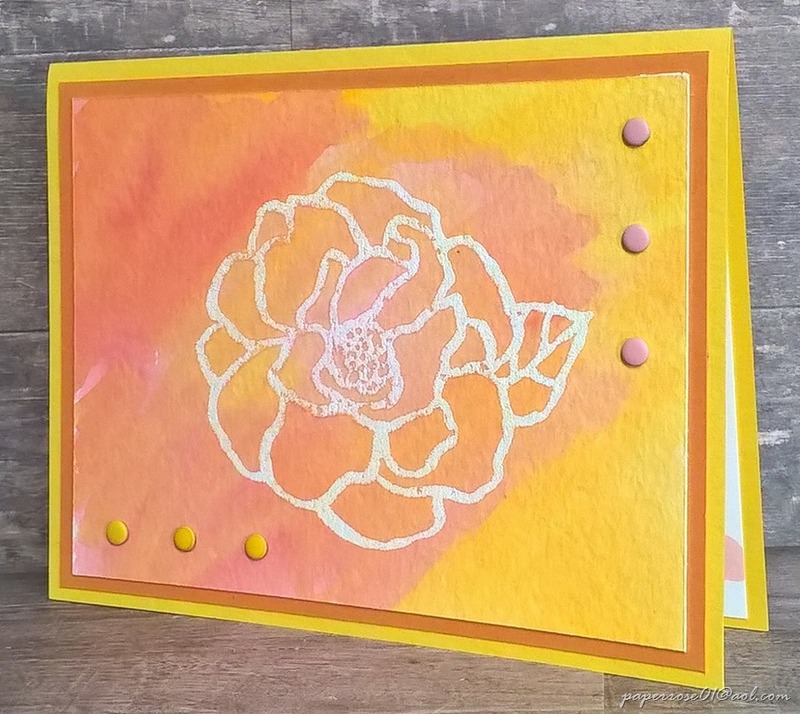 I experimented with several colors of embossing powder, but the white gives the best results. I did add the gold metallic “celebrate you” but I think that may have been overkill. This second sample has a bit of orange added. Note how I have toned my color down some from the original card. The embellishments are limited to retired candy dots in yellow and red. 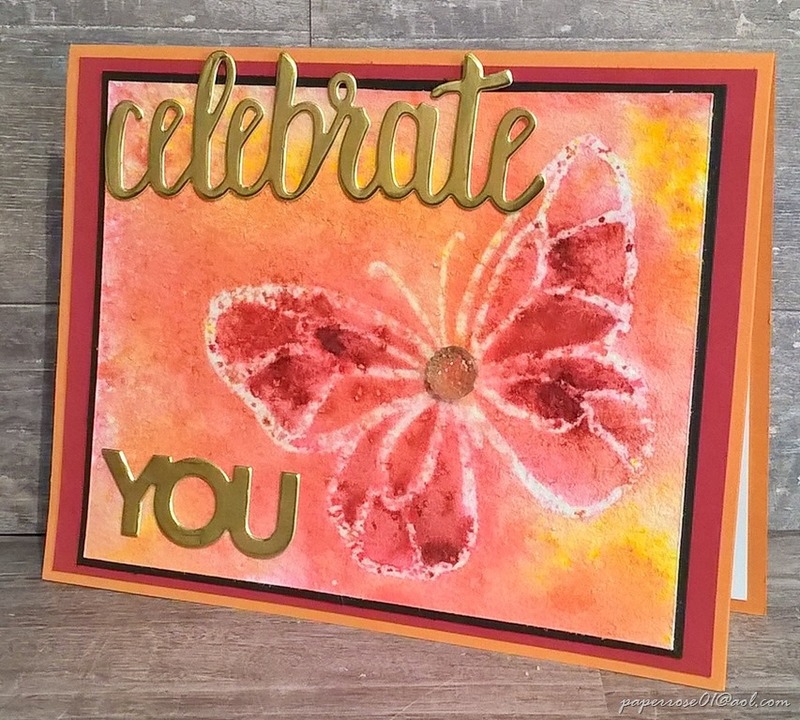 Butterflies and roses from the Beautiful Day stamp set have been white embossed on watercolor paper and also on shimmery white so you can choose which you want. The watercolor paper gives you a rough finish while the shimmery white is smoother and – well, shimmery! This sample was watercolored with aqua painters and diluted Brusho from a paint palette. The color was simply brushed on lightly. A paper towel could be used to wipe off any excess and speed up the drying process. As I noted before, there are no rules with Brusho. You can have pop art as noted above or a peaceful watercolor as seen here. The choice is yours. I have quite a few samples including one in blue and yellow. I tend to gravitate toward the red and yellow. WOW! Quite an assortment for April Stamp Camp! A flower card, birds, a beach scene and some pop art!!!! April Stamp Camp will be on Thursday April 5th from 1 to 7 pm, Friday April 6th from 2 to 7 pm, and Saturday April 7th from 9 am to 4 pm. Come for the laughs, stay for the cards! Cost remains $12 which covers everything you will need including water, coffee, and soda pop. Please let me know which day you might be attending as it helps my planning. I look forward to seeing each of you. Let me know if you have any questions or concerns.